BPI offers several energy auditor certifications that can be applied to single-family and/or multi-family homes. The most popular BPI certifications are the entry-level designations for small homes energy auditors, such as Building Analyst and Envelope. 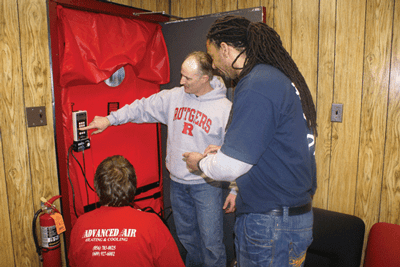 Another popular certification is BPI Infiltration & Duct Leakage, which offers a specialty in blower door and duct leakage testing. The more advanced certifications generally apply to more specialized skill sets, such as AC/Heat Pumps. Because these certifications naturally overlap in subject matter, it's possible for a home energy auditor to achieve more than one BPI credential. At Everblue, we've packaged our BPI training program in such a way that enables participants to pursue up to 3 credentials in one week! To earn the BPI Infiltration & Duct Leakage Certification: you must pass a 2-hour field exam with a score of 70% or higher. There is no written exam for this designation. To earn the BPI Building Analyst Certification: you must pass a written and field exam. The 2-hour, 100-question, written exam requires a passing score of at least 70% while the 2-hour field exam requires a passing score of 85% on the combustion safety and carbon monoxide testing modules and 70% overall. To earn the BPI Envelope Certification: you must pass a written and field exam. The 2-hour, 100-question, written exam requires a passing score of at least 70% while the 2-hour field exam requires a passing score of 85% on the combustion safety and carbon monoxide testing modules and 70% overall. Everblue provides the knowledge and technical skills training to help you prepare for these exams. Our BPI training courses also include the written and field exam fees and 2-hour testing slots. A individual's BPI Certification is valid for three years. To maintain the credential, an individual must acquire 30 continuing education units (CEUs) or retake the written and field examinations. Everblue offers BPI Recertification options for BPI-certified professionals who need to retake these exams. While many contractors seeking BPI certification already have extensive experience in the building industry, Everblue's intensive week of BPI training is a perfect introduction to home energy efficiency and weatherization for anyone at any skill level. This training will help you to gain building science knowledge and related practical skills that will benefit your business and help the community to become more energy efficient. Go back to the BPI Energy Auditor Overview main page.